If you access the Youth Work Essentials website you agree to be bound by the conditions in this legal message and further agree that the Courts of Scotland shall have exclusive jurisdiction in respect of any dispute arising from this legal message. If you do not agree with the conditions in this message, do not use this website. The copyright in the material contained in the Youth Work Essentials website belongs to Youth Scotland. All rights are reserved. Except solely for your own personal and non commercial use no part of this website may be copied, performed in public, broadcast or adapted without the prior written permission of Youth Scotland. 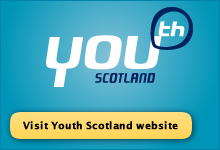 Youth Scotland assumes no responsibility for the contents of any other websites to which the Youth Work Essentials website has links. To the extent permitted by law Youth Scotland shall not be liable to any person for any loss or damage that may arise from the use of any information contained in this website. The material contained in this website is not aimed at or meant to be viewed by persons other than those in the United Kingdom. Any person who chooses to access the website from other locations is responsible for compliance with applicable laws. We would like to make you aware that cookies may be used on this Website. A cookie is a very small text file that is placed on your computer's hard drive when accessing a website and it collects standard internet log information and visitor behavior information. This information is used to track visitor use of the Website and to compile statistical reports on website activity.